Dave Jansen captured the Bellator MMA Lightweight Tournament title on Thursday, banking $100,000 and a shot at lightweight champion Michael Chandler when he defeated Marcin Held. It was a back-and-forth fight with Held winning the opening round and Jansen coming back to take the next two. 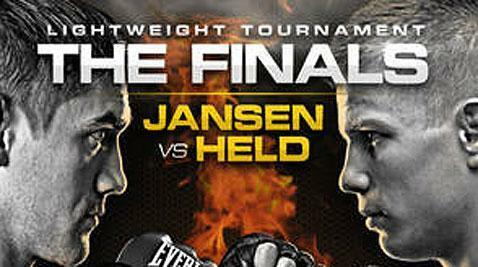 Jansen defended Held’s submission attempts while battering him with punches and hammerfists. As the fight wore on, Held slowed and Jansen took advantage while putting his submission defense on display. “I’m feeling total elation, relief, just gratitude, happiness, peace and love. I get a little peace in my life now, for a week at least,” said Jansen following the win. In the co-main event Ryan Martinez knocked out Travis Wiuff in just 19 seconds of their heavyweight fight. A left hook followed by a combination dropped Wiuff and Martinez finished with a series of right hands forcing referee Dan Miragliotta to step in and stop the barrage. In welterweight action, the bout between UFC veteran Marcus Davis and Waachiim Spiritwolf was ruled a no-contest after Davis landed an unintentional knee to the groin of Spiritwolf rendering him unable to continue. Spiritwolf was given the full five minute allowance to recover. He was asked by the referee three times whether he could continue, but Spiritwolf stayed on the canvas. When a fight is halted from an unintentional infraction, if the foul happens before the completion of two rounds, the fight is ruled a no-contest. If it were an intentional foul, Davis would have been disqualified. If the knee had happened in the third round, the judges’ scorecards would have been tallied and a winner determined.